Feather moving forward, working hard, in Gaylyn’s well groomed barrel arena. Saturday Lauren and I had planned to go to our friend Gaylyn’s house for a little outing with Feather. Feather, at four, is just enbarking on her life with us and her life as a show horse. It is important that we do things the right way the first time and develop a horse that is quiet, capable and willing when we get to the show ring. So, I have no idea what I was thinking when I thought we would take Leo and Feather to Gay’s house. I guess I was thinking that Feather had come all the way from Florida in a trailer just a few short months ago and she would not have issues getting back into the trailer. I was so wrong!. When Feather first got here from Florida she had to re-load from the giant transport trailer into our three-horse slant trailer. We had no issues. The next day we hauled her to the vet. She loaded in and out without a problem. Since then we hauled her one time up to Caroline’s for an outing with Mickey and Leo. She was sweating and a little edgy but re-loaded easily for the ride home. My original theory was to load Feather first then Leo would come in behind her. First, I am not pointing fingers, but Lauren was in a crappy mood. It was early, she is never patient on a good day and this was no exception. Feather didn’t want to get in the trailer. She would get to trailer door and back off dragging Lauren with her. She did that a few times. Then we decided to put Leo into the first slant. Oh, he went in, but then started pawing and kicking. His behavior freaked out Feather further. She was not riding shot gun with Leo. Perhaps she had read my blog. No riding with Leo! We decided to go get Mickey and take Feather with him. I’ve got to tell you, when Mickey is your go-to guy, life is nuts. Mickey had years when he would not load in a trailer without serious prompting along with bolting and dragging his handler. In the meantime, Lauren and I are both sweating and complaining about our stupid horses and it isn’t even 8:00 am yet. Mickey, in his current place, as the king of the herd and champion of Six Meadow Farm, walks right in the trailer. He stands patiently as we figure a way to get Feather in with him. I got a short whip and stood behind the horse, while Lauren lead her forward into the trailer. It took a couple of trys and couple of hard retreats (dragging Lauren out of the trailer with her) but Feather loaded and we were off to Gaylyn’s place. Gaylyn and I have been friends for several years. Both of us moved our families from Sugar Land to this little town to have more space for our horses. Gaylyn has run top-quality Quarter horses and a few paints in barrels and poles over the years. She has made her mark at Quarter Horse World and as a dear friend. Fortunately, we live only about ten minutes apart. I was very happy with Feather when she got to the new arena. A show horse must settle in to new places. There isn’t time to be afraid of everything, buck or run. At a new arena, my horses need to be ready to work. Feather really took the whole new place in stride. She certainly was looking around and taking it all in but not in any crazy or difficult way. Boomer, with his perfect head cocked toward the mare. Gaylyn’s young, home-bred, gelding, Boomer sure had his eye on my mare. He is a pretty perfect looking Quarter horse. I think he liked the looks of my leggy grey mare as well. We all had good rides working on our multiple horse disciplines. 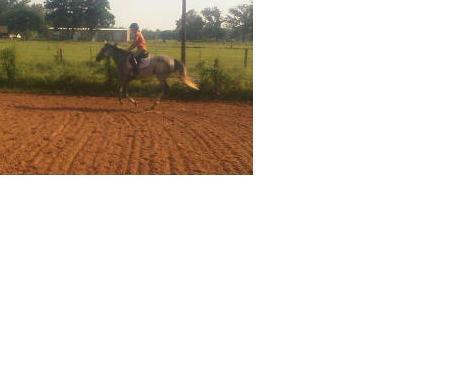 Gay was working her barrel horse stuff, lots of canter circles and stops. Lauren was trying to get the mare collected up and moving well. 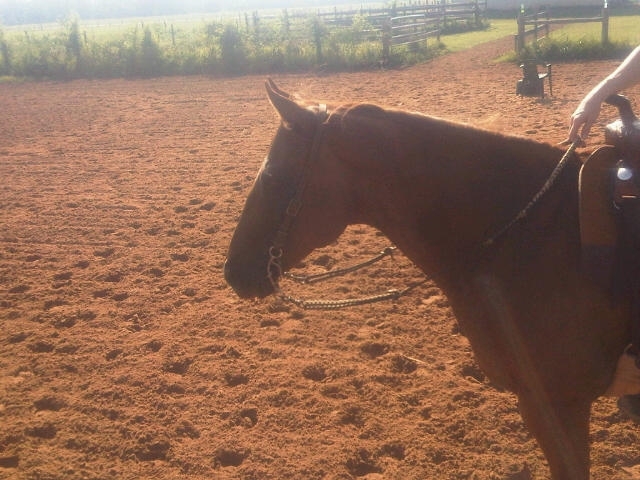 I was riding Mickey, walk, trot and canter with my main goal to stay in the saddle. Gaylyn turned to watch Feather work. She remarked that the mare moved powerfully and yet smoothly. I definitely was proud of Feather (and Mick) when the cows in the pasture next door start a mini-stampede for their barn. Feather watched them carefully but made no move to run or spook. We got both horses in the trailer pretty easily and headed home. It is good to have good horses and good friends. Feather will practice loading each day this week until her departure to Dev’s for more training on Thursday. I bet she will be a pro by then.